IMAGINE….become a judge, a doctor, a lawyer, a teacher. Our clients have reached these goals with our assistance. Watch how CART can work for you! This past year has been very difficult as I am learning my new profession. Having full access to communication today, I’ve learned so much and most of them would have helped me months ago at my job. Again, my sincere appreciation to you. Managing a global team for MSN with staff located around the world and working on a dynamic new product launch with tight schedules can be tough, but thanks to Captions Unlimited, being deaf has not impacted my ability to communicate with my team. Caption Unlimited’s transcriber had a challenging job, with a fast speaker, lots of jargon and unusual vocabulary, and I don’t think he missed a single word. I am, once again, stunned by the effort made to ensure that ALL employees have full resource access. I am thrilled at how things have worked out with our CART Services and am happy to hear that you’ve connected with folks that I have recommended. I continue to sing your praises! I look forward to continuing to work with you. I’ve worked for Denise directly, as well as known her from my work in the captioning industry. Her captioning ranks in the best in the nation. I recommend her without reservation. In the decade I have been working with Denise Phipps and Shawn, her office manager, no matter what time of day it is, I’ve don’t think I’ve waited more than 10 minutes for a reply – their client communication is amazing. 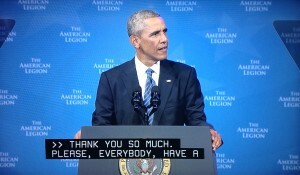 The American Legion has used Captions Unlimited for several events over the last few years, and we can not be happier with our experiences. Denise and her team are always well prepared and very professional. Captions Unlimited has provided us with the consistency and accuracy of their finished worked product ever since we contracted transcription services with them. Their turnaround time for transcriptions is also second to none. Confidentiality is always maintained and has never been an issue. Their attention to detail, flexibility and exceptional customer service, places them heads and shoulders above their competitors. Through their superior coordination, attention to details, technological support, and timeliness at all times, we have been able to complete jobs that lesser companies would have no hope of completing. Closed captioning (CC and subtitling are both processes of displaying text on a television, video screen, or other visual display to provide additional or interpretive information. We provide open and closed captioning in many venues: Graduations, awards ceremonies, musical, theater and other performances. Captioning is used to enhance the spoken word in many venues where the acoustics and/or other ambient noises prevent clarity of the spoken word. Captioning can be simultaneously broadcast over the TV, Internet via webcast and/or YouTube. We can turn your transcripts into captioned files quickly and economically. We can also transcribe your audio/video and provide a transcript and/or caption file. Whether you need captions for your YouTube video, a Microsoft Word transcript, or both a transcript and a caption file, our price is the same whether you need one file type or multiple file types. 24-hour turnaround services are available. Many television producers use our timestamped transcripts as a tool to expedite their editing process. For example, they can shoot three hours of footage and use our timestamped transcript to find the video timecodes. This allows them to quickly search video clips and create a half-hour show. Realtime captioning is sometimes referred to as Communication Access Realtime Translation [CART]. Over 28 million Americans have significant hearing loss. While the use of sign language is common, many people who are deaf or hard of hearing rely on English to communicate. The development of broadcast captioning opened the world of television news and entertainment to people who are deaf or hard of hearing. But that new technology was left behind in their living rooms when they ventured out into their communities. 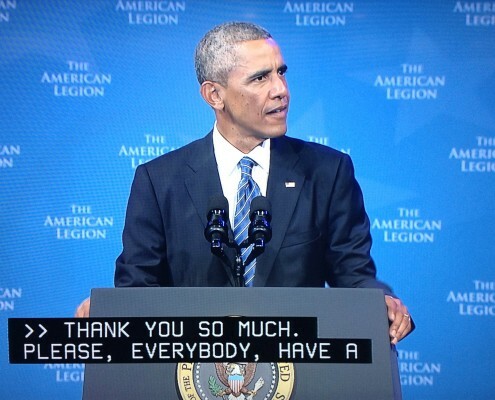 Now there is realtime Internet captioning to take communication access wherever it is needed. CART providers offer realtime captioning at events like religious services, conventions, business meetings, public hearings, or in classrooms. 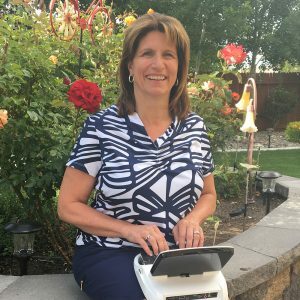 Denise Hinxman is owner and CEO of Captions Unlimited of Nevada, Inc. She has been providing captioning and CART services since 1992. Denise frequently lectures and demonstrates the benefits of realtime captioning all over the world. Captions Unlimited’s network of captioners and CART providers spans the United States and Canada. We specialize in providing CART and captioning in highly technical areas. The United States has several laws covering accessibility requirements for persons with disabilities, including those who are deaf or hard of hearing. On October 8, 2010, President Obama signed the Twenty-First Century Communications and Video Accessibility Act (CVAA) into law. The CVAA updates federal communications law to increase the access of persons with disabilities to modern communications. The CVAA makes sure that accessibility laws enacted in the 1980s and 1990s are brought up to date with 21st century technologies, including new digital, broadband, and mobile innovations.